When starting the game, the main menu will appear. SEE INTRODUCTION: click this option to watch the prologue to the game (the Ballad of Freddy Pharkas). When the prologue ends, the player will automatically start a new game. PLAY NEW GAME: click this option to start playing from the beginning of the game, skipping the introduction. RESTORE OLD GAME: Select this option to restore a previously saved game. READ TECHNOBABBLE: provides (no-longer valid) information on customer service, sales, technical support, warranty information and such. QUIT: Select this option to quit the game. When the mouse is not at the top of the game window, you can see the top bar, displaying the game title and current game score. When you move the mouse to the top of the game screen, the icon bar will appear. Walk icon: Click on the first icon or right-click the mouse for the mouse pointer to change into a walk icon. Then click on a location on the screen to walk there. In some screens in the game where you can't walk around (such as close-up screens), the walk-icon may be unavailable, but an exit exit is available to return to normal view. 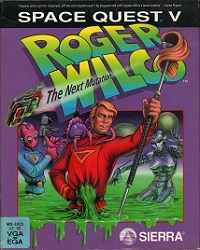 In this game, the walk icon becomes a fly icon when Roger is turned into a fly on Genetix, or a broom icon when he's operating the scrub-o-matic in the Academy. Eye icon: Click on the second icon or right-click the mouse for the mouse pointer to change into an eye icon. Then click on a location on the screen to observe objects, people and so on. Hand icon: Click on the third icon or right-click the mouse for the mouse pointer to change into a hand icon. Then click on any object or person on the screen to touch, activate or pick up items. Items which are picked up are placed in the inventory. Talk icon: Click on the fourth icon or right-click the mouse for the mouse pointer to change into a talk icon. Then click on a person on the screen to talk to him or her and get a response. This icon is particularly useful to obtain interesting information or funny lines from your crew members while you're traveling to another planet. Command icon: Not to be confused with the talk icon. When you use the command icon on one of your crew members, a list of possible commands appears. Droole is in charge of flying the ship and weapon systems, Flo is in charge of communications and Cliffy is the engineer, responsible for the transporter and cloaking device. You can also issue commands to W-D40 after Cliffy has repaired her. Cliffy and W-D40 can be given commands through the intercom. Also use the command icon on the teleporter to beam away. While off the ship, Roger can use the PCD (Personal Communications Device) to contact Flo and request beaming..
Current item icon: in the small window, right of the taste icon, is the inventory item which currently displays Roger's PCD. Click it or right-click the mouse for the cursor to change into the inventory item and click it anywhere on the screen to use it on a person or item. When no inventory item is selected, this window will be blanked out. Inventory icon: click on the inventory icon to open the inventory window. Settings icon: click on the icon with the slider bars to display the game control panel. Question mark: Click on the question mark and the cursor will change to a question mark. Click the question mark on any of the toolbar icons to get a description on what they are for. In this window, you can look at, activate or select inventory items. To select an inventory item, click the select icon (the arrow icon), then click on the desired inventory item and then click "OK" to return to the game screen. The selected inventory item will be displayed in the menu bar. Note that you can also combine inventory items in the inventory screen. If you have many inventory items, they may not all fit in the window. If so, the arrow button becomes available. Click it to see more inventory items. In the control panel, you can save, restore, restart or quit the game. You can also change various settings, such as the detail (though that make no difference when playing in DOSBox), game speed and music volume. By clicking on the HalfDome icon, you see the game credits. Also the game score is displayed here once more.